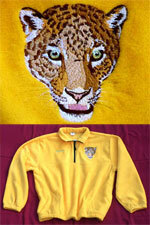 This high quality fleece pullover with Exclusive Jaguar High Definition Embroidery Portrait #1 is a wonderful fashion statement for all nature lovers; Huggable, cozy and warm, loved by adults and children alike; Designed by Ildiko Pataki; Unique Embroidery Design by Vodmochka Graffix. The polyester threads used for the embroidery are highly resistant to fading. We mail these items usually within 2-4 days, depending on the options you selected.